I received these decals recently, and they looked so good that I felt that they should receive some publicity, especially since they are of subjects not often seen in this country. These are products of AML, in the Czech Republic, and have instructions in both Czech and English. During World War II, or the “Great Patriotic War”, as it was known in the Soviet Union, many thousands of airplanes, trucks, and tanks, and vast quantities of other military and economic supplies were sent to the Soviets under Lend-Lease. Many Americans and other Allied personnel risked, and gave, their lives to get the convoys through to Murmansk, or to deliver the aircraft through Iran and other ports. The American aid, and to a lesser extent, B ritish aid, was helpful in turnin g the tide against the Germans. Countless firsthand accounts by surviving German participants are consistent in stating that they were amazed at the number of American vehicles and aircraft encountered by their forces. 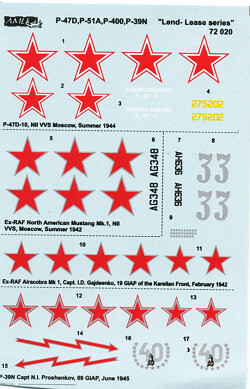 These decal sheets provide markings and insignia for a number of Lend-Lease aircraft operated by the Russians during the war. 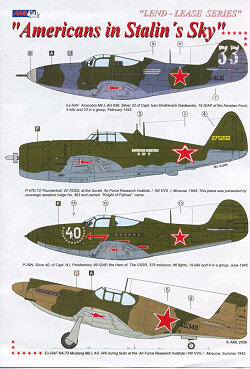 P-P-47D-10-RE, AF 42-75202, NII VVS, operating near Moscow, Summer, 1944. P-39N, Capt. N.J. Proshenkov, 69 GIAP, June, 1945. P-47D-27-RE, White 39m 255 IAP, Northern Fleet, Vaenga 1 Airfield, Winter, 1945. These decals appear to be suitably thin and of very good quality. They are on register, with nothing out of line. 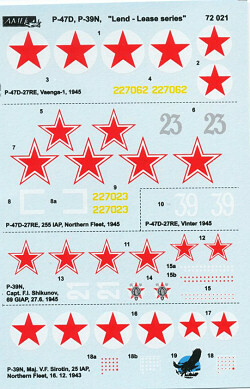 Basic insignia and personal markings are provided, but no maintenance stencils are given, probably because these were painted out, as most Russian ground crews probably couldn’t read English. 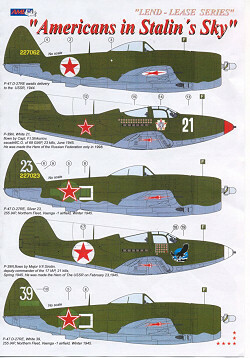 In addition to the decals, each envelope contains a standard sized instruction sheet which gives a series of excellent color drawings of the aircraft in question. In addition to TWO side views, top and bottom views are included, so there is no question as to where a particular decal goes. A list of colors is shown on one of the sheets, and this provides Humbrol, Gunze, Lift Color, Agama, and FS color standards. As an added bonus, each envelope also contains a small postage stamp sized photo etch sheet containing two sets of brass seat belts> These are identical for both decal sets, but should be useful in detailing the cockpits of these aircraft. If you would like your product reviewed fairly and quickly by a site that has 300,000 visitors a month, please contact me or see other details in the Note to Contributors.